Hi Linda! Tell us a little bit about yourself. Knotwork LA is my line of ceramics and crafted projects: I was born in Orange County in 1982, studied industrial design at Pratt in Brooklyn. After a decade in the eyewear industry I needed to work with my hands again and found myself creating one-of-a-kind objects. Eventually this led me back to Southern California and to ceramics. 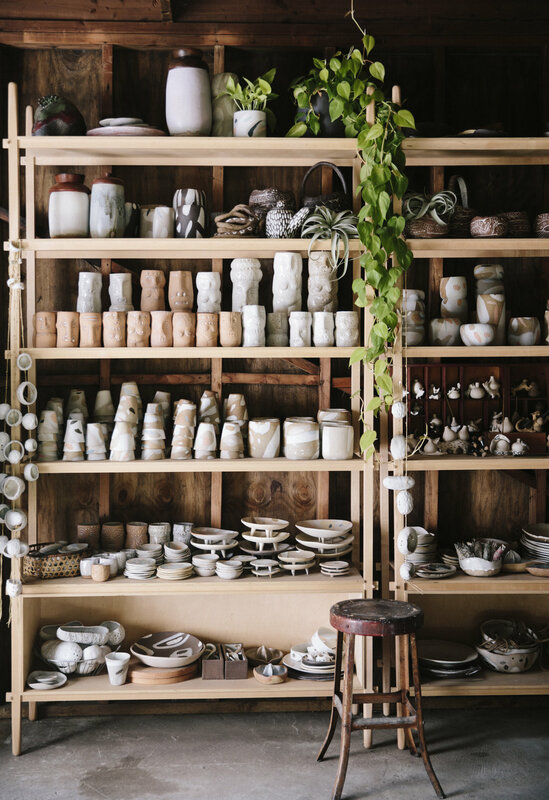 After moving to Los Angeles in 2009 I started taking classes in studio pottery, I have always loved exploring the outdoors, and draw on the landscape of my childhood and surroundings for much of the inspiration for my work. Which includes both functional and conceptual/decorative ceramics, woodware, and home product design. Is Knotwork your full time job? If so, how did that transition of careers work for you? If not, how do you manage the balance between different work lives? As of two years ago I took the leap and turned Knotwork LA into my full time job. Scary at first, I had realized over Christmas that I had no idea how I was going to make a living in the New Year. I spent 5 whole days just working on a line sheet and sent it out the first thing in January hoping for the best! All of my work is handmade and one of a kind. Most work starts out as a form of exploration both of material and process. I’m always looking and exploring. Sometimes I’ll see something on a hike or in a museum that will remind me of something and those little seeds translate into ideas. And store up some ideas to get into the studio. I always have a to-do list of experiments. It’s always changing. Recently I had a lot of fun making tons of Darumas getting ready for the Chinese new year. Every time I made a Daruma doll face I would think of what which or goal would be asked of him from his new owner. Right outside my studio window is my garden. When I need a little break I can just head out the door and tend to my vegetable garden or tend to the plants in my studio. Nature, materials and creatures around us, and our mythologies. My porcelain inlay began with a curiosity of how different clay would react pressed into each other. Reminding me quickly of the sedimentary rock cliffs in the beaches of my childhood in Laguna Beach. Fossils and different textures and color embedded into on rock kept me mesmerized. Creatures embedded in the fossil Inlay Platters are born from the organic shapes hidden in the natural slab of the inlay and each one comes to life and develops a personality of its own. Seasonally I sell at craft fairs and small events locally. It’s a great way to see first hand what people respond to and things they are excited about. The Echo park Craft fair and West Coast Craft have been great shows for me to exhibit and show my handmade wares. Hillery Sproatt – Illustrator of amazing little worlds that have recently turned into blankets, Hannah Keefe – Beautiful chain jewelry soldered into amazing patterns, Salihah Moore – beautifully patterned beaded jewelry, Carson Terry – hand forged objects with a rustic modern feel. It’s important to know where things come from and it’s especially amazing when you can support from your own local community it’s a great feeling. I have some work in some nearby shops in my neighborhood in Highland park and make sure to shop there when I need a gift. It’s a lovely feeling that we are all taking care of each other. I just love how with so few tools and my bare hands I am able to create things of function and joy. I especially love to see the excitement from small children picking out a creature or daruma to adults happiness picking something out for their own home. Getting orders was a bit tough at the beginning. I kept freelance work designing eyewear to make sure I had an income. But in the end my brand only really flourished when I was able to devote myself 100%. With every other industry I’ve worked in it’s always been male dominated. Now that I’m working for myself, it’s amazing to see so many other women out there doing their own thing. It’s important for all small makers to support each other especially for us women. It's hard to go all in and start your own business, having friends that have been there to ask for guidance and mentoring new makers in turn has been something that has made me feel part of a community of women makers. Iphone, Instagram, Square and Bigcartel. They’ve really made it so easy to bring other people into my world. Being a visual person I have a much easier time showing rather than explaining what I do. Even now when people ask I tend to question if I’m an Industrial Designer, Artist or Ceramicist. But when they see my work they understand and all four of those things have really helped me show what I do. I start making To-do Lists to help me organize my thoughts and organize things that need to get done and that usually just gets me back on track. Growing up, I saw my parent’s farm in Orange County, California. They grew fruits and vegetables for the Asian market from seeds. And my mom propagated every single fruit tree in acres and acres of orchards. She always creating something out of nothing and that was very inspiring. What are some of your favorite places in LA? Hiking and swimming holes in the Angeles Crest National Forest. When I first moved back to California much of that was a feeling that I needed to be closer to nature. Switzer Falls and Hermit Falls are my go to easy hikes to escape quickly and reset myself.